Kayaking the Mangrove Tunnels in Sarasota, FL is the best kayaking Around! Your best adventures in Sarasota are still found at South Lido when you smooth through the enchanted mangrove forest. Known as the “mangrove tunnels” or the exotic mangrove tunnels — as owner Laurel Kaiser first named the area in 1995 — the experience is still astonishing to the first timer and a repeat thrill for those who have entered the forest many times. 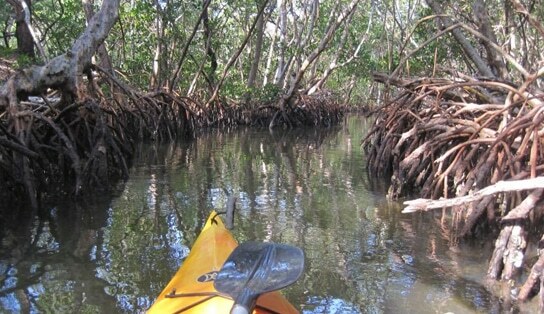 The best kayaking in Sarasota is definitely a lido key kayak tour, which we call an Adventure in Paradise, and the best opportunity for viewing of birds in the Mangrove Tunnels is in the late afternoon when the scores of people have departed and the mangrove tunnels and the forest again return to the wild creature habitat that it truly is.